With a smoking experience that is similar to that of premium cigars, along with a low price tag, filtered cigars are a popular option here at Smokers Discounts. They have great flavor and are perfectly portable for when you’re out and about, so it just makes sense to add some discount little cigars or discount premium filtered cigars to your order. At Smokers Discounts, we’ve seen just how much filtered cigars have grown in popularity as the cost of retail smoking brands continue to skyrocket! The best part of smoking a premium filtered cigar is experiencing the same great taste, but at a fraction of the cost of that favorite smoking brand you buy down the street at your local retail store. With many varieties to choose from, why not give our discount filtered cigars a try? 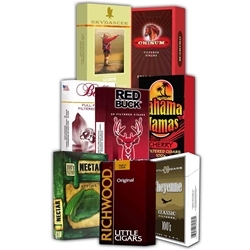 Our popular discount filtered cigar brands include perennial favorites such as Richwoods, Red Bucks, Swisher Sweets and Nectar, as well as some of the top reviewed filtered cigars -- names like Cherokee, Cheyenne, and several more. Depending on the brand you choose, our filtered cigars and little cigars are available in popular flavors such as full flavor, light, mild, menthol, cherry, vanilla and many more. Because each filtered cigar is equipped with its own filter just like your favorite smoking brand, you get a smooth smoke that enhances the flavor of the tobacco inside. That allows each smoke to give off its own distinctive taste with a pleasant aroma, ending with a smooth finish. Smokers Discounts not only offers some of the lowest prices on a wide selection of the world’s finest smokes, but specials are also available each week online, so check back with us often for the best deals. Look for the brands, flavors and styles you like buy and try some of our premium filtered cigars today!